A beautiful, soft and fluffy cinnamon roll cake with a gooey cinnamon center and vanilla icing melting into every crevice. (1) Make the dough: Set aside ½ cup of flour. In a large mixing bowl, whisk 2¼ cups flour, sugar, salt, and yeast together until evenly dispersed. Set aside. (2) Heat the water, milk, and butter together in the microwave until the butter is melted and the mixture is hot to touch. About 115-120°F degrees (no warmer than 130°F). Stir the butter mixture into the flour mixture. Add the egg and only enough of the reserved flour to make a soft dough. Mix until dough slightly pulls away from the bowl. (3) On a lightly floured surface, knead the dough for about 3-4 minutes. Form a ball and place in a lightly greased bowl. Cover tightly and let rest for 30 minutes. The dough will rise slightly. (4) Make the filling: After 30 minutes, roll the dough out in a 15x12-inch rectangle. Spread the softened butter on top. Mix together the cinnamon and sugar and sprinkle it all over the dough. Spray a 9-inch round pan with nonstick spray. Set aside. (5) Using a very sharp knife or a pizza cutter, cut the dough into six 2-inch wide strips. Loosely roll up one strip and place it in the center of the pan. Roll it up loosely so the dough has some give as it rises. Coil the remaining 5 strips around the center roll, starting each strip at the end of the previous one to make one large rolled cake. Some of the filling may spill out as you pick up the strips, which you can just sprinkle on top of the cake after spiraling is finished. (6) Loosely cover the cake with aluminum foil or plastic wrap and allow to rise in a warm, draft-free place for about 60-90 minutes. (7) After the dough has nearly doubled in size, preheat the oven to 350°F. Bake for 30-35 minutes until lightly browned. Cover the rolls with aluminum foil after 15 minutes to avoid heavy browning. *While the cake is baking, some spots may rise up more than other spots. That's completely normal and well, quite expected! Simply remove the pan from the oven and press down on the sides with the back of a spatula on the spots that are rising more than others. (8) Make the vanilla-maple glaze: Mix the sifted powdered sugar, milk/cream, maple syrup and vanilla together until smooth and drizzle over rolls. If you prefer a thicker glaze, add more powdered sugar and then add salt to cut the sweetness, if desired. (9) Remove cake from the oven when it's done. Allow the cake to cool for about 10 minutes. Then, right before serving, drizzle with glaze. (10) Cake is best enjoyed the same day, but will remain fresh covered tightly for up to 4 days at room temperature or in the refrigerator. *Overnight: The dough may be made the night before through step 6. Allow the cake to rise at room temperature for 12 hours. If it rises *too* much overnight, gently press down a bit before baking the next morning. *For the glaze - you can leave out the maple syrup to make it a standard vanilla glaze. Or leave out the vanilla, so it's a plain maple glaze. 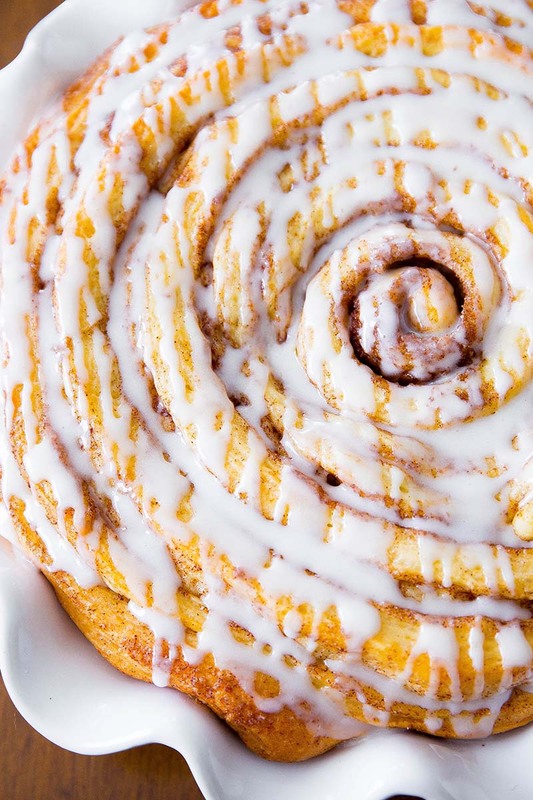 This giant cinnamon roll looks awesome! It’ll be a great way to start this Saturday morning!